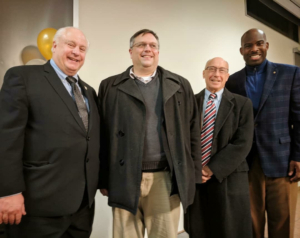 URDC President Charlie McGloughlin and URDC Executive Director Joseph Waldo met with City of Philadelphia Councilmen Al Taubenberger and Derek Green at East Mt. Airy Neighbors (EMAN) “Toast to Mt Airy” event on January 26 to discuss URDC’s home repair services for seniors. URDC is working with ACES Museum in Germantown to assist veteran homeowners who need exterior repairs to their homes. ACES, located at 5801 Germantown Avenue in Germantown, honors black and minority veterans. Working through URDC’s Owner Occupied Program, which assists low-income and senior homeowners with costly exterior home repairs, ACES identifies veterans that need assistance with these repairs. URDC’s Program meets with these veteran homeowners and develops a financing package for their repairs through a combination of low-interest loans, grants, and volunteer days. Some of the supplies and materials for these repairs are also provided courtesy of the Home Depot Foundation. Currently URDC is working with three veterans located in Mt. Airy, Germantown, and Overbrook. Their work includes window and door replacement, painting, porch repair, and furnace installation. URDC is proud to honor our veterans by working with ACES to assist those who served our country. If you know of a veteran that needs assistance with home repairs, contact URDC through our web site: www.buildgermantown.com. URDC BOARD MEMBER MAKES SAUSAGE TO HELP GERMANTOWN HOMEOWNERS! URDC Board member Charles McGlaughlin has a unique fundraising tool: he makes sausage! Charlie is a member of URDC member Germantown Mennonite Church and renowned for his sausage. For years he has been making his links from scratch for friends and family using his secret recipe and has a reputation for making some of the best sausage in Philadelphia. This year, Charlie decided to put his sausage making talents to good use: he began selling his sausage and donating the proceeds to URDC. In a little over a month, Charlie raised $500 from sales of his sausages. His generosity will help two senior homeowners living on Lambert St. and Bloyd St. in Germantown. The attached picture shows Charlie presenting his check to URDC Board member Beverly Lucas (from First United Methodist Church of Germantown). Interested is trying some of Charlie’s famous sausage? Send an email to URDC through our website and he will contact you. http://buildgermantown.org/wp-content/uploads/2017/11/imagejpeg_0.jpeg 480 640 Joe Waldo http://buildgermantown.org/wp-content/uploads/2017/03/URDC_LogoTag.png Joe Waldo2017-11-21 17:59:142017-11-25 18:57:37URDC BOARD MEMBER MAKES SAUSAGE TO HELP GERMANTOWN HOMEOWNERS! URDC and St. Lukes Episcopal Church, 5421Germantown Ave., have teamed up to assist low-income/elderly homeowners with costly home repairs. Thanks to its large dormitory and kitchen facilities, St. Luke’s is able to host a large number of out-of-town groups each year for volunteer projects in Philadelphia. One of these projects will be with URDC to work on home repairs for elderly and low-income homeowners in northwest Philadelphia who are unable to complete these repairs themselves. It allows elderly homeowners to “age in place” in their own homes and creates safer, healthier environments for their families. The joint URDC/St. Luke’s project began in June and will continues in September and October. Anyone can join in these volunteer efforts – contact URDC for more information. URDC and the Urban Affairs Coalition (UAC) have joined together to offer low interest home repair loans to low-income or senior homeowners as part of the City of Philadelphia’s Mini-PHIL program (made possible by Philadelphia’s Division of Housing and Community Development). Mini-PHIL can loan up to $15,000 towards basic home repairs for clients of URDC’s Owner Occupied Home Repair Program. After talking to URDC staff, homeowners schedule a free one-time counseling session with a housing counselor in northwest Philadelphia. Once qualified, they work with Mini-PHIL’s partner bank for loan processing. URDC will identify reputable contractors to perform the work and ensure successful completion of the repair. URDC is very excited to work with its newest partner to assist low-income and senior homeowners in northwest Philadelphia. Together we will Build a Better Germantown…One House at a Time. 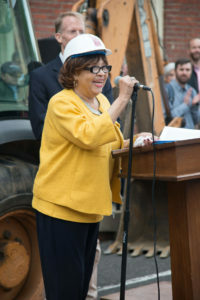 URDC Board Member Betty Turner spoke at the Green Street Friends Groundbreaking on May 11. It was the first step towards a new auditorium, gymnasium, music room, science lab, art room, and classrooms for the school. Betty spoke on how the new 19,500 square foot building will impact the community and support the school’s mission. URDC was recent highlighted in Germantown Beat, the online news source for Germantown. The article described URDC’s programs and interviewed one of URDC’s homeowner beneficiaries, Mr. And Mrs. Garrett, of West Oak Lane, calling URDC’s program “a godsend”. Read the entire article here. URDC completed another successful home repair for a senior in East Oak Lane. Ms. Jones is an 87-year-old homeowner who has lived in her home since 1957. She lives alone and needed a number of repairs to remain in her home safely, including a new back door, patching of basement walls, and a new bathtub, as her current tub was too high to use safely. URDC provided Ms. Jones with a grant to finish her repairs, since she could not afford them based on her Social Security income. Ms. Jones’ repairs were part of URDC’s highly successful Owner Occupied Program, which helps finance costly home repairs for senior and low-income homeowners in northwest Philadelphia. The program has assisted over 275 families and allowed them to live in safer, healthier homes. It is part of URDC’s mission to Build a Better Germantown….One House at a Time. A key part of URDC’s home repair program to low-income and senior homeowners is the offering of low-interest, non-collaterized loans that help pay for expensive exterior projects. In an effort to identify more bank partners to offer these loans, URDC has been working with FINANTA, a Community Development Financial Institution (CDFI) that facilitates access to capital and technical assistance in the Philadelphia region for entrepreneurial expansion, affordable home ownership, consumer borrowing, and community development. In March, URDC met with FINANTA’s Advisory Committee composed of representatives from local Philadelphia banks. 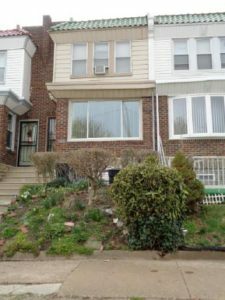 The banks were introduced to URDC’s mission and programs in northwest Philadelphia, as well as some success stories of homeowners who have benefited from URDC’s projects. A number of banks and institutions expressed interest in working with URDC, which will help expand the capacity of its highly successful home repair program.